This product is useful as an isotope control for rabbit IgG, especially in comparison to Abwiz recombinant rabbit antibodies. 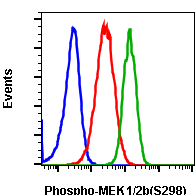 In all assays tested, we have not observed any significant non-specific binding from this antibody. This includes flow cytometry, Western blot, ELISA, and biolayer interferometry (Octet). We obtained this antibody from a mouse immunized with keyhole limpet hemocyanin (KLH). This antibody binds to specifically to KLH, an antigen not expressed on human cells, mouse cells, or other species. 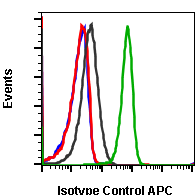 In contrast to isotype antibodies supplied by other vendors, which have unknown or unreported specificity, we let you know the target of this antibody so that you can determine if it is suitable as a control for your specific assay. 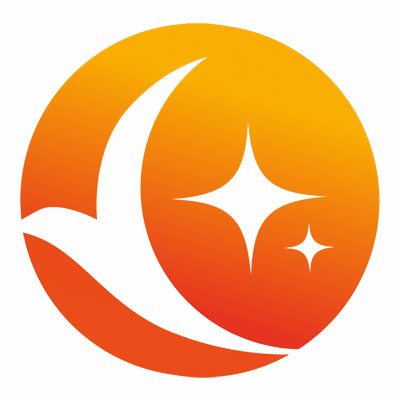 We are currently experiencing technical difficulties with our website that we hope to resolve soon. For order inquiries, please e-mail sales@abwizbio.com. International shipping is available. Keyhole limpet hemocyanin carrier protein. 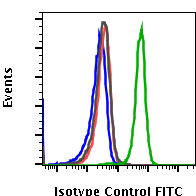 Isotype control antibodies should be used at the same concentration as the test antibody. KLH-G9 does not show non-specific binding to human cells. 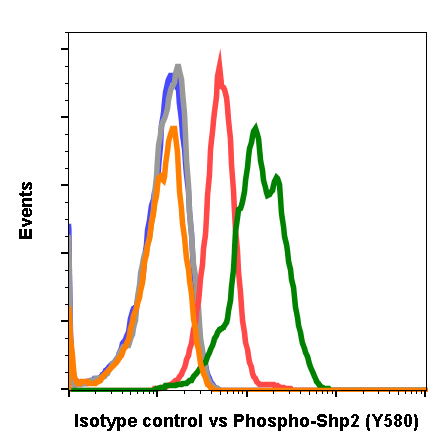 Flow cytometric analysis of Jurkat cells secondary antibody only (blue) or untreated (grey) or treated with anisomycin (orange) using isotype control antibody KLH-G9 Cat. 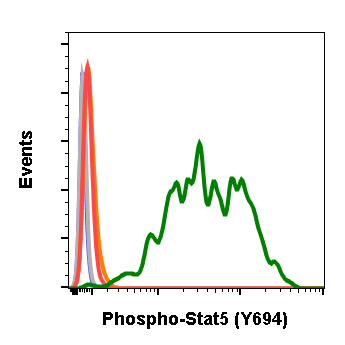 #2141 compared to untreated (red) or treated with anisomycin (green) using Phospho-ATF-2 (T71) antibody ATF2T71-G3 Cat. #2056 both tested at 0.1 µg/mL. KLH-G9 does not show non-specific binding to mouse cells. 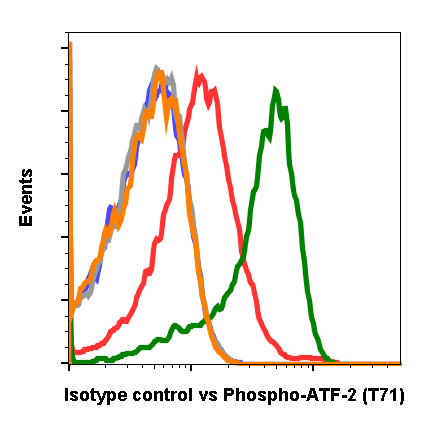 Flow cytometric analysis of NIH3T3 cells secondary antibody only (blue) or treated with imatinib (grey) or with pervanadate (orange) using isotype control antibody KLH-G9 Cat. #2141 compared to imatinib (red) or pervanadate (green) using Phospho-Shp2 (Y580) antibody Shp2Y580-4A2 Cat. #2101 both tested at 0.1 µg/mL. 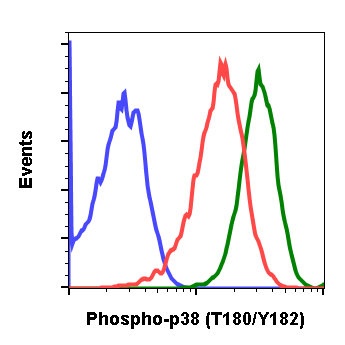 KLH-G9 does not show non-specific binding in Western blot applications. 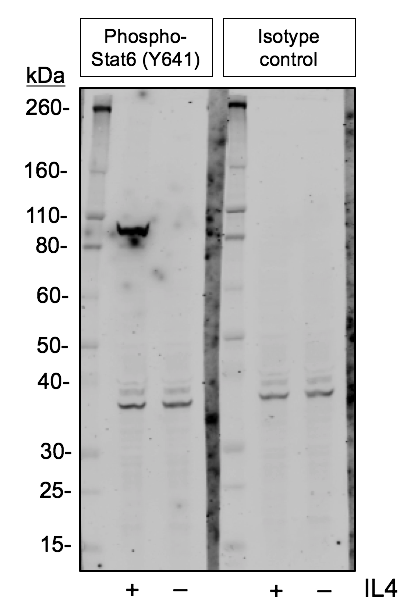 Western blot analysis of Daudi cells untreated or treated with 200 ng/mL IL-4 using isotype control antibody KLH-G9 Cat. #2141 or using Phospho-Stat6 (Y641) antibody Stat6Y641-G12 Cat. #1146 both tested at 0.01 µg/mL.